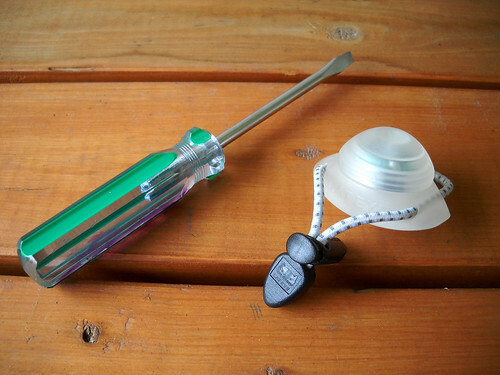 Changing batteries in the Cateye Loop is extremely easy, but only once you know how. I tossed the packaging the day I got it, and I don’t see instructions online, so I had to figure it out for myself. If you’re having trouble getting it apart–since it’s not at first obvious–then follow the instructions below. First, grab a flathead screwdriver. I took the headlight off my bike while I did this, but you an just as easily leave it mounted. I got this little light a few days ago for those rides where I want to be sure I’m seen by drivers, but I don’t feel I need a headlight to help me see the road. There are a few different types of these small, easily mounted lights on the market, but since I’ve had good luck with Cateye products in the past, I decided to skip the others and try the Loop. 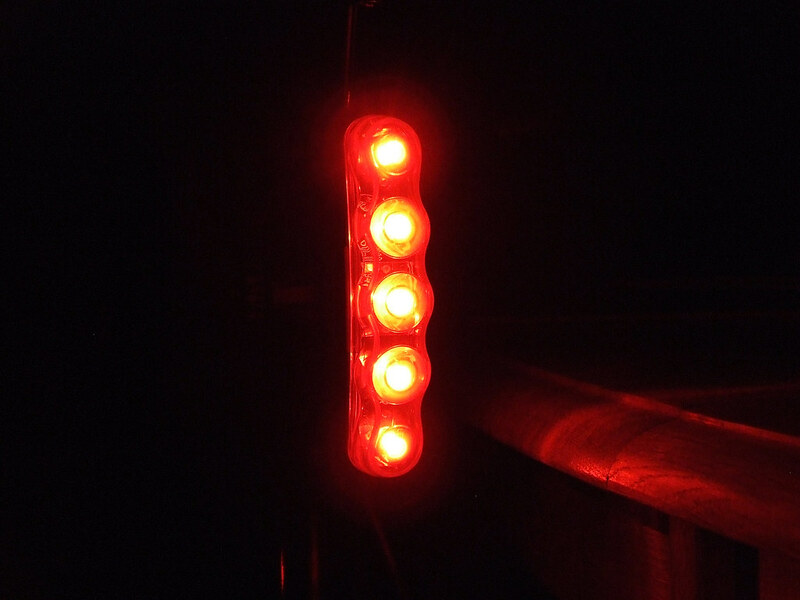 Cateye makes this light in both with and red, but since I already have a Cateye TL-LD610 taillight, I just went with the white version. Mounting couldn’t be easier, since all you have to do is wrap the elastic band around your handlebar, frame, seatpost, backpack, or wherever you want to mount it, and you’re done. The body of the light is made of semi-translucent gel, so it mostly conforms to whatever you mount it to. You can tell by the curvature of the back that it’s designed to fit a 31.8mm handlebar, although it bends around my 25.4mm bar just as easily. I doubt I’d want to mount it on a thin seatstay, like I have on my steel road frame, but I think it’d work pretty much anywhere else. 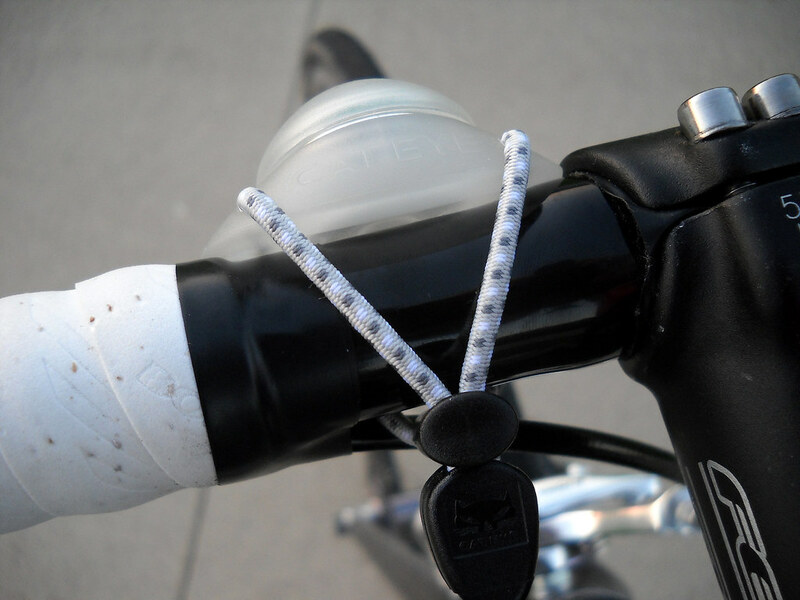 Since it weighs only 22 grams, you could even leave it on your bike all the time, and not notice the extra weight.